Welcome to a very special tour to this beautiful region of southwestern France. 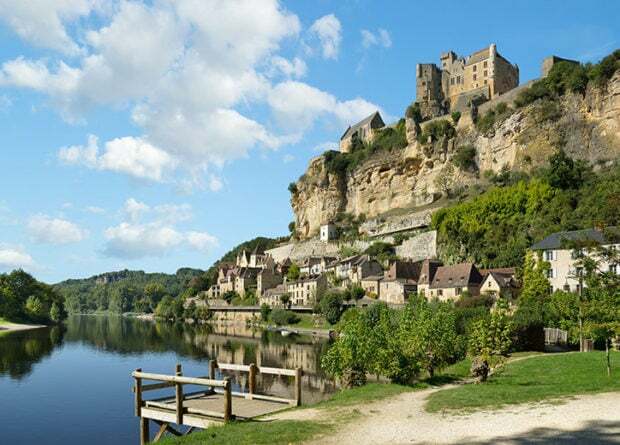 The French consider the Dordogne River to be the most beautiful river in France. You will soon understand why as we immerse ourselves in this timeless landscape. Sunlight mixes with shadows and history mingles with rural French culture. Row past châteaux, some stern and austere, perched high on impossible cliffs, glaring across green valleys. Others sport turrets and fanciful carvings, nestled among gardens. Discover other histories of pilgrimages, battles and prehistoric cave paintings. Sheltering the history is a lush and varied landscape, as the river cuts a winding path through ancient limestone. At times it feels surprising remote and untouched. We also pass delightful towns and villages, built of this same warm, golden rock. It is a beautiful river to row. Périgord is the former name for this region, now largely within the département of Dordogne. Four regions, identified by different colours, make up Périgord. 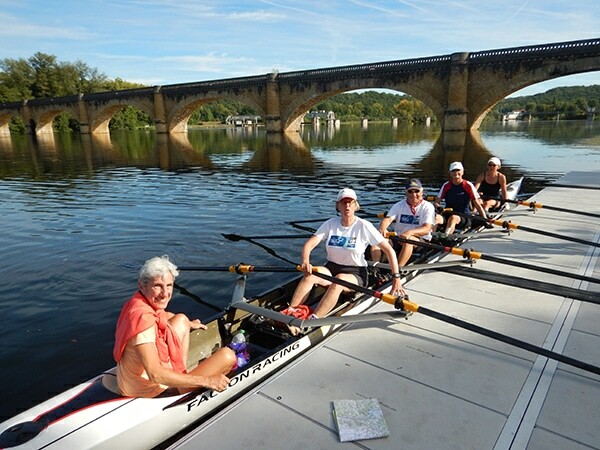 We will row and travel through black and purple Périgord in the heart of the Dordogne River, France. Called noir because of the thickness of the forests, this is where we begin our rowing. Here the hills are higher, the stone honey coloured, the cliffs dramatic, and the towns filled with narrow, twisting streets. Some such as Domme, built on the top of a high hill, are bastides – towns with straight roads for the best defence. 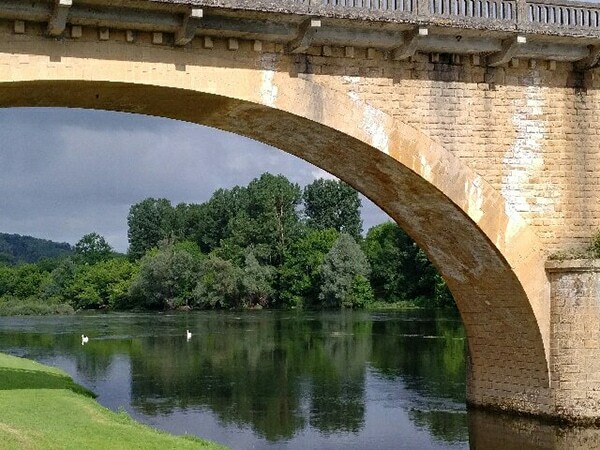 We end in Périgord Pourpre, so named because of the vineyards producing wines. The hills are gentler here, the limestone whiter. Always strikingly beautiful. We do more than just row through some of the most beautiful landscapes in France and visit some of its most interesting sites. We also spoil ourselves with wonderful accommodation and excellent food and wines. A charming hotel in Sarlat in the heart of the medieval quarter starts our Dordogne River trip. After rowing past castles we stay in two different chateaux – albeit more modest domaines. 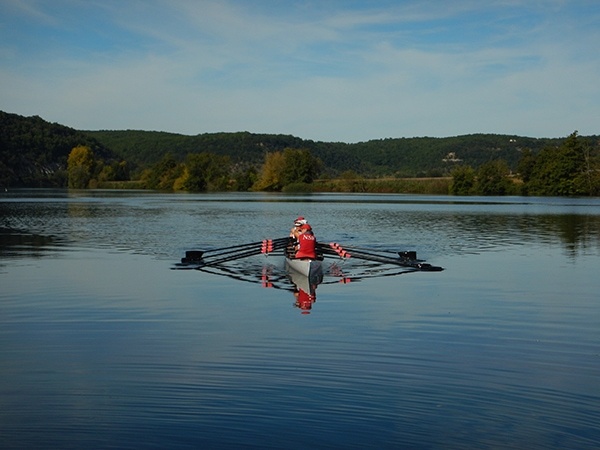 All this rowing will create good appetites to enjoy the famous gastronomic cuisine of the Southwest: confit de canard, cassoulet, truffles, foie gras, tarte aux noix, washed down with the rich reds of Pécharmant, Bergerac and Cahors. Our last accommodation is surrounded by vineyards and we enjoy a private wine tasting at a small, organic Bordeaux vineyard. On y va! A beautiful collection of photos from guests on the 2018 trip! 15 – 30 km per day. Coxed touring quads. Maximum 10 rowers. We usually have two trips in the southwest of France running just a few days apart. We are still finalizing our Lot Weekend trip. 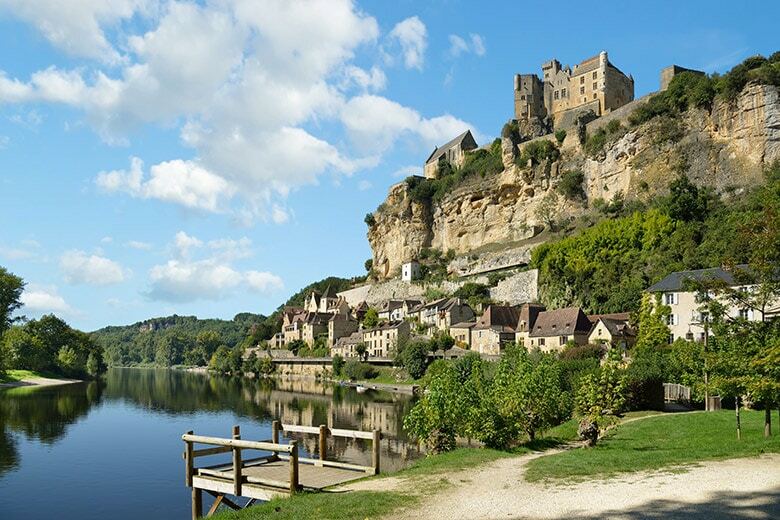 If you join us on this Dordogne trip and our Lot Weekend, we will take 150 € or equivalent off your total invoice. All breakfasts, five lunches and six dinners. Accommodation in high level accommodation, including two modest chateaux. Use of rowing shells, including trailering. Guide services and tour support. Guided by Ruth Marr and Henri-Pierre Dall’Aqua. Cultural visits. Alternate activities for poor weather days. Note that is itinerary is subject to change. Many variables will affect the rowing, especially water levels and current. Alternate rows have been identified in the event that water levels are too low. Arrival in Sarlat. The Michelin Green Guide ranks Sarlat as *** “worth making a journey”, it’s highest rating. A few steps along the winding streets of the medieval quarter will soon convince you too. Settle into our charming hotel, where we will enjoy a welcome dinner. For our first day of rowing we will travel upriver to either Souillac or St. Julien de Lampon. The descent begins! The scenery is instantly spectacular. Limestone cliffs rise high above the water. Walnut groves, lush and green come to the opposite shore. Glimpse the first castles, especially as you row around the Cingle de Monfort. We will store the shells in Vitrac and return to Sarlat. More time to stroll through the old quarter. Remember to look up – there are so many details carved into the beautiful golden buildings. Dinner on your own tonight. Today is non-stop sensational sites. First we row past stunning views of Domme perched high on its cliff. Then you will not believe La Roque Gageac, a beautiful troglodyte town with the buildings built right into the cliff. But the scenery doesn’t stop! On past Castlenaud and then more bends to Beynac. The river between these two castles set the boundary for the Hundred Year War between the French and the English. Beynac is particularly impressive, with the town pressed into the cliff with the formidable castle towering above it. Our destination is St. Vincent de Cosse where we can stroll from the boats to our own little “domaine”. This morning we will return to Beynac to walk the streets and explore the castle. 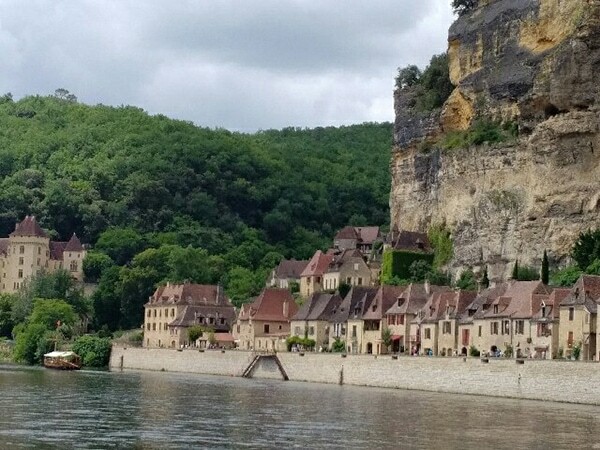 With a bit of trailering we row in the area of Limieul, which is yet another “Plus Belle Village de France” perched above the confluence of the Vézère and the Dordogne. The section of the river through the Cingle de Trémolat is surprisingly remote, tranquil and of course beautiful. Dozens of birds will be your only companions. We will leave the boats in Mauzac and return to St. Vincent de Cosse. Today we have choices. 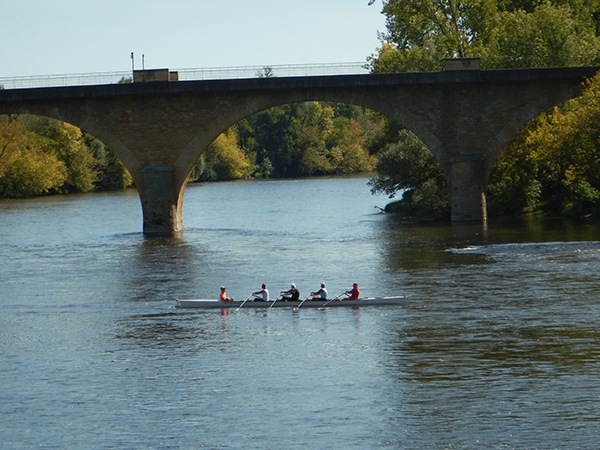 One option is to take the boats to Bergerac rowing club and enjoy a day rowing the basin of this charming city best known for the Cyrano de Bergerac novel. The old quarter is lovely with half-timbered buildings as well as those built of a whiter limestone. Alternately today could be a rest day, with an excursion to visit the fantastic Lascaux IV with its astonishingly good cave art replicas and an excellent tour of the prehistory of Europe. To get there we will drive the Vézère valley, past Les Eyzies-de-Tayac, the home of Cro-Magnon man. There is so much history in these rocks. Today we move to our next hotel in the tiny village of Badefols-sur-Dordogne. We will move the boats downstream past Bergerac dam, then launch to row to Ste-Foy-la-Grande. The river is wider and deeper and so we find our first rowing club where we leave the boats for the evening. Before heading to the hotel, we might detour for a visit to Moncaret Roman villa. Sleep in another small chateau among the vineyards of Sainte Radegonde. It is a short transfer back to Ste-Foy-la-Grande. We are in the Bordeaux wine region now. Villas and vineyards appear along the shore. As we approach our final destination of Castillon-la-Brave the river becomes tidal. What a wonderful descent. To celebrate, we will be given a tour of a private winery with a delightful garden. The wines are all organic and only can be purchased onsite. Very special. We return to our chateau near Sainte Radegonde for a final farewell dinner. Departure with transfer to local train station. We will definitely be sad to say au revoir to the most beautiful river in France.